Concept is the performance oriented Raven son that we've been waiting for! He's an awesomely constructed bull who was the lead-off representative in Oklahoma State's Class Winning Pen at the 2010 NWSS. 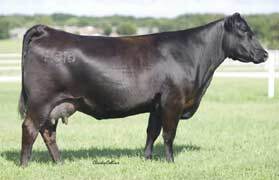 Many astute cattlemen picked Concept as one of the top sire prospects at Denver. Concept is extra stout boned, big footed and VERY, VERY heavily muscled; not to mention wide-based, masculine, deep-bodied and sound structured with big scrotal! Concept is most likely Raven's #1 $B son! Concept's dam is one of the best OSU has ever had!